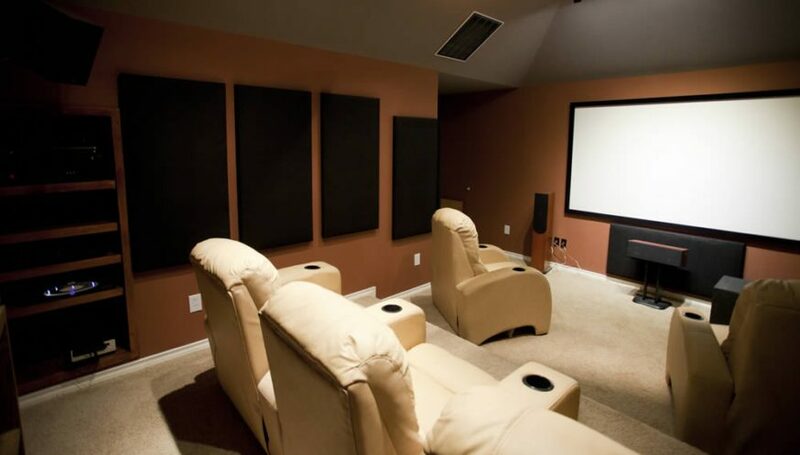 Blog Home Theater Design & Media Room Guide: Add Wow Factor! Bethesda, Washington, DC and Baltimore are all cities with magnificent mansions and elegant homes. Adding high tech home theaters in these homes has become a popular option. They provide high-end cinematic experiences for their owners who settle for nothing less than the very best. At Rasevic, we’ve seen a thing or two after 25+ years of luxury home construction and remodeling. We’ve helped plan and build countless home theaters. So here is an essential guide to home theater design with an array of tips for adding a new “wow factor” to your home. The first step in the creation of a comfortable, technologically superior home theater design involves careful planning. Every homeowner has different space to work with, different needs, and a different budget. Each feature must be customized to respect the integrity and style of the home too. Considerations for planning a media room include the room’s size and location. It’s best to design a home theater during the planning stages of new construction. Without this foresight, you may have construction challenges down the road as you retrofit your space. 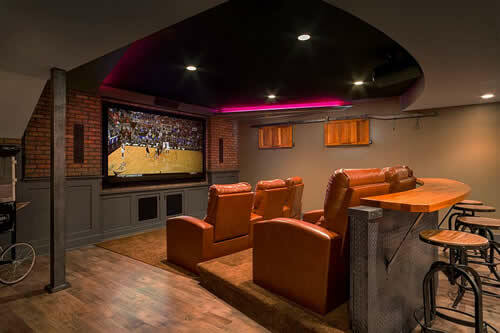 Even if a home theater isn’t completed until a later date, planning ahead allows for proper wiring and fixtures upfront. The ideal space will allow plenty of room for seating, and will have very few windows, doors and closets. The homeowners should collaborate with the building contractor regarding the room’s preferred layout. It also helps to visit home technology and theater showrooms to get a feel for the latest equipment available. We recommend doing this before plans are drawn up so specific equipment can be fitted in the space. Then the contractor can draw up plans that illustrate the locations of all equipment, accessories and features. Creating a home theater that is capable of broadcasting content from a variety of devices and sources is vital. Careful planning should also be centered around how to connect the electronic devices in ways that obscure all wires. Internet streaming devices like Sonos, Roku, Amazon Fire, Chromecast, etc. Your TV selection is probably the most important decision you make in your home theater design. It determines so much about the layout of the room. At you know, TVs come in countless sizes, depths and resolutions. Online research is invaluable, but we also recommend in-store consultations to make sure you get the quality you desire. A brief look around the web will turn up a lot of valuable research. 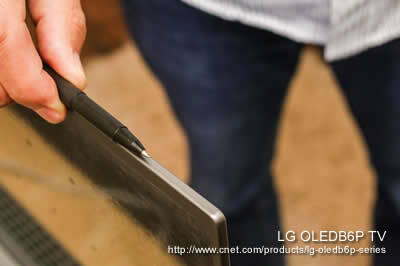 For example, CNET claims the LG OLEDB6P series TV has the very best picture on the market and a screen thickness about the size of a pen! For a lower cost and nearly as good picture, they recommend the Sony XBR-X930D or the Vizio P-Series that actually comes in under $1000. 720p or 1080p – this is the screen resolution. For example, 1080p is most common these days and it displays a resolution of 1920 x 1080 in a progressively scanned display of high definition content. LCD – Liquid Crystal Display technology. These TVs block light rather than emitting it, so they consume less power. OLED (pronounced “oh-led”) – Organic Light-Emitting Diodes TVs were introduced in 2013 and provide outstanding clarity and picture quality. They are considered the thinnest of all displays. 4K or Ultra HD or UHD – These TVs became mainstream in 2016 and have a resolution of 3840×2160 pixels. That’s four times the 1920×1080 pixels found in a typical LED TV. A receiver is like the heart beat of your home theater. It brings all your devices to life. We recommend buying a high quality receiver that includes Built-in Wi-Fi, AirPlay and Bluetooth. Make sure it has the the right number of HDMI inputs and the wireless technologies you need. Ezvid.com, an American consumer research organization, recommends the Marantz SR7010 9.2 receiver as the overall best choice in high quality receivers. But CNET also has several buying guides and recommendations. There are many surround sound speaker options available. First, decide if you want wired or wireless speakers. According to HGTV, “While wireless is convenient and popular, ask any electronic systems contractor and they’ll tell you that a wired connection is more reliable, secure and consistent.” CNET recommends Pioneer SPEBS73-LR as the best sounding speakers. Another option is the ultra high quality Bowers & Wilkins 805 D3 speakers coming in at about $6,000 a pair. They are the “diamond standard” in speakers. If you choose to cut the cable like millions of Americans, you may want an over-the-air DVR to record your favorite shows. CNET’s product review team deems the TiVo Roamio Pro as best cable DVR and whole-home theater TV solution. Another popular option is to go with Roku and subscribe to services like Hulu, Netflix, Amazon Prime, etc. for watching movies and TV shows anytime. Of course no home theater design would be complete without a high quality Blu-Ray player. BestReviews rates the OPPO BDP-103 Universal Disc Player highest in terms of performance, reliability and features. Of course, all equipment should be customized to the homeowner’s preferences, typical use and budget. Once the equipment choices have been finalized, it is time to move on to the design of the room itself. Design considerations like comfortable recliners, recessed equipment, adjustable lighting, soundproof walls and a concession stand create a true theater feel. Proper seating for your needs and space is essential. 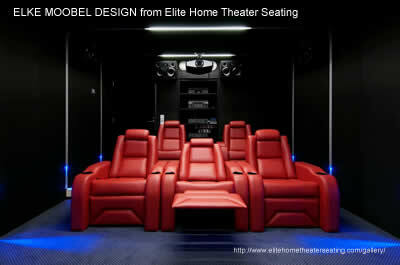 Elite Home Theater seating is listed by many consumer choice surveys as the ultimate theater seating experience. Each seat is constructed from fine Italian leathers with handmade craftsmanship. The interior core of every seat is made of comfortable, premium foam, and each seat is chiropractic endorsed for the ultimate in back-supporting comfort. If you have a more moderate budget, most local furniture stores have lower cost options for theater seating as well. Zero-sound drywall is the best option for new construction home theaters. Other sound dampening materials can help too, such as curtains and sound panels. If the homeowner wants a quick fix to an already-existing room, acoustic panels can be mounted on the walls. These panels are used for the isolation and absorption of sound, as well as to improve the overall acoustic qualities of a room. A disadvantage of using acoustic panels is that some people find them unattractive. However, newer, high-end panels are available in wide variety of colors. Buyers also have the option to have art or photos silkscreened on them for a truly customized look. Complex systems can be integrated in ways that allow the homeowner to access theater systems and subsystems with a touch screen. This includes touch screen operation of lights, heating and security. Think like a rock star! Home theater owners can control virtually everything, whether they wish to open their gates for guests, to start a film in the theater, or warm up the sauna. If you live in the Bethesda, Washington, DC or Baltimore metro areas and are interested in having your own high-end home theater design, please call 301-986-6900 or contact us online. Rasevic Construction Company specializes in custom home construction, remodeling and additions.